Uruguay’s left wing political coalition, the Broad Front party (Frente Amplio), retained control of the presidency in the November elections. This wasn’t just any election. 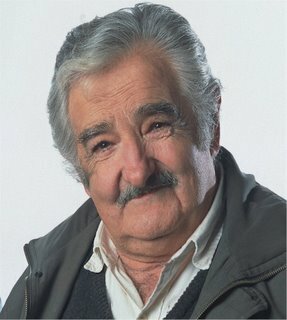 The winner, flower farmer Jose “Pepe” Mujica, was the victim of imprisonment and torture during Operation Condor in the 1970’s as a result of his efforts as a Tupamaro rebel. During that period of military dictatorship, the new president spent fourteen years in prison, including two years confined at the bottom of a well. Mujica won 48% of the vote in the initial round of elections on October 25. He then pushed his total to 52% for a comfortable victory in the November 29 runoff voting against Conservative candidate Luis Alberto Lacalle who gained 44% of the vote. In the 2004 elections, outgoing President Tabaré Vázquez, also of the Broad Front coalition, won with just over 50% of the vote. Mujica set an expansive tone in his inaugural speech by stating, “My government will be a government of open doors, and above all a negotiating administration … we will demand commitment, compromise and hard work” MercoPress, Nov. 30. He then announced meetings with President Lula da Silva of Brazil and Argentine President Cristina Fernandez de Kirchner. The victory was celebrated by tens of thousands of jubilant Uruguayans on Montevideo’s ocean front. It represents the second leftist win in a nation journalist Michael Reid describes as one of two “consolidated democracies” in Latin America (Costa Rica is the other). The election is the climax of over fifty years personal drama for President-elect Mujica and a national struggle that began with a repressive military dictatorship and a revolutionary response during the 1960’s and 70’s. Thousands of citizens were kidnapped, tortured, exiled, and imprisoned while urban resistance was, at times, marked by violent action against the ruling junta. From 1986 on, a “broad front” of leftist parties aligned to fight the blanket reprieve the crimes of the military leaders. While this referendum was defeated 52% to 42%, an expanded coalition won a 1992 national vote that prevented the privatization the national telephone company and other public utilities. The creation of the Broad Front as a peaceful force for social democracy after years of the most repressive dictatorship is a story worth telling. The election of a former rebel leader imprisoned and tortured for fourteen years is the stuff of great stories. You don’t have to be a socialist to appreciate the Uruguayan election. The mainstream media barely covered the story, although a number of dailies carried the Associate Press summary by Michael Warren, Ex-guerrilla easily wins Uruguay presidency. The New York Times relied on a Reuters News story, Former Guerrilla Wins Uruguay Presidential Run – Off. A more in depth review of this election and the changes in Uruguay would have revealed a remarkable story of suffering, struggle, and redemption; a story that shows the long term vitality of social movements focusing on the core issues faced by the vast majority of citizens. Under the code name, Operation Condor, from 1976 on, intelligence agencies for the military dictators in Uruguay, Argentina, Chile, Brazil, Bolivia, and Paraguay waged a “dirty war” against dissident citizens claimed to be “terrorists.” This meant nonviolent social reformers and socialists, plus a much smaller group actually using violence as a tactic. The terror inflicted by the dictatorships dwarfed any rural or urban violence they sought to control. Over sixty thousand people were murdered or “disappeared” and torture was routine. Citizens in the Condor nations were victimized by the loss of political freedom and vicariously traumatized by living in an environment of kidnappings and violence perpetrated by their governments. The Nixon administration established the overall methodology by supporting the violent coup staged in Chile that removed Salvador Allende, the elected president, and replaced him with General Augusto Pinochet. There is evidence that Operation Condor was an extension of previous U.S. government sponsored efforts against the left in Latin America. The war was particularly rough on Uruguay, a smaller nation, where human losses and to political repression were experienced daily by citizens. Yet despite this violent history, Uruguayans, Brazilians, and Chileans persevered to regain basic human rights. For years now, the civilian governments that replaced the military dictators have been investigating and unearthing the past horrors as a preventive measure against future abuse. Legitimately elected governments of leftists operate through coalition building and shun reprisals. At the same time, here in the United States, the new administration is reviving an eight year old war in Afghanistan. It refuses to investigate and prosecute the architects of torture while it provides legal cover for the former government lawyer whose opinions enabled that torture and eviscerated the Constitution. There are lessons to be learned from the history leading to Uruguay’s current democracy. One of them is honestly facing the truth of the past.